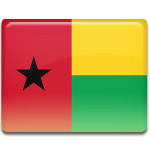 National Day of Guinea-Bissau is celebrated on September 24. This public holiday commemorates the proclamation of the independence of the Republic of Guinea-Bissau from Portugal in 1973. Guinea-Bissau is a small state located in West Africa. The colonization of the area by the Portuguese started in the 15th century. By the late 19th century, the entire territory of present-day Guinea-Bissau was controlled by Portugal. It was incorporated into the colony of Portuguese Guinea. In 1952, Guinea-Bissau was granted the status of an overseas province of Portugal. Four years later, the first liberation movement was founded in the province. Originally the African Party for the Independence of Guinea and Cape Verde (PAIGC) was a peaceful movement, but in 1963 it started the Guinea-Bissau War of Independence. The war lasted for over ten years. On September 24, 1973, PAIGC proclaimed the independence of Guinea-Bissau. It was recognized by Portugal in September 1974, following the Carnation Revolution. National Day (Independence Day) of Guinea-Bissau is widely celebrated across the country. The holiday is marked with official speeches, solemn ceremonies, and other festive events and activities. The main celebration is held in the capital city of Bissau.